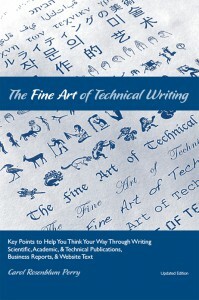 The revised edition of The Fine Art of Technical Writing is available on amazon.com. First published in 1991 and updated in 2011, this friendly little book is the outgrowth of my many years’ experience editing manuscripts. In it — distilled — are key points about writing to help you as an author think your way through, whatever your subject matter and experience level. FATW approaches technical writing broadly because the same principles apply regardless of your material. It emphasizes “making order.” And it’s as much about the psychology of approaching writing and the artistry of shaping it as it is about technique.